The Giants, New Jersey, The Super Bowl… BRUCE SPRINGSTEEN! 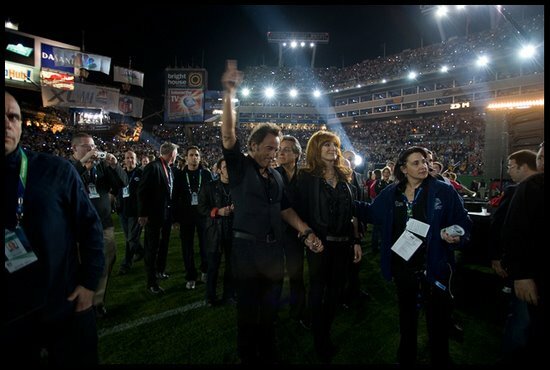 From his journal, the Boss talks about a 12 minute gig at Tampa’s Raymond James Stadium that was one of the biggest shows of the band’s life. Shout out to Max Weinberg (seen in between/behind Bruce and Patti), drummer for the East Street Band, Conan O’Brien, and Columbia High School grad (where my daughters currently attend). This entry was posted on February 15, 2009 at 11:00 am and is filed under Bruce Springsteen, Max Weinberg, Super Bowl XLIII. You can follow any responses to this entry through the RSS 2.0 feed. You can leave a response, or trackback from your own site.
. my little sister attended a COLUMBIA HIGH while i lived in MAPLEWOOD from ’95 till 2000 my old man still lives in Maplewood. Best thing to ever happan to me was my dad buying that house in Maplewood. what a lifestyle change!